Report all income: You are required to report all your income for the year, including cash. The CRA receives copies of all T slips issued, so if you forget, misplace or hide one, it will inevitably be uncovered by the CRAs matching program and result in a reassessment. Keep receipts: There are some credits that are more likely to be reviewed than others. Moving expenses, for example, are commonly reviewed. Keep all your receipts in the event you are asked to supply them, even if you file electronically. Being asked to produce receipts should not be a concern, as long as you claimed everything correctly. Be honest: Claiming higher than usual expenses is asking for trouble. For obvious reasons, the CRA does not publicize the amounts that will automatically trigger a review; however, if you are claiming 95 per cent vehicle use for your business, expect it will want to see your log book. Protect yourself: Use a reputable tax preparer or certified tax software package. Some tax packages, like H&R Block at Home, offer free audit assistance in case your return is reviewed. Your tax preparer should be available year round in case the CRA has questions and should support you in case you are audited. Deal with it: Many Canadians avoid opening brown envelopes from the CRA because they are afraid of the contents. But not responding to the CRA could make your situation worse, so open all your mail as soon as you receive it. While there is no way to guarantee avoiding an audit, there are common mistakes that can attract unwanted attention. “Your best defense against an audit is old-fashioned honesty. Save your receipts, report all your income and file accurately,” says Hamel. 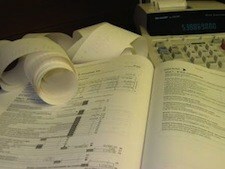 If you do end up getting audited here are a few tips on how to deal a tax audit. Is the CRA tougher than the IRS?